When it comes to extending the rear of your property, you have two classic options: rear and side. But what if you could combine the two? This is what’s known as a wraparound extension, and it’s a popular choice for homeowners looking to gain as much rear space as possible, but don’t want to eat up too much of their garden. A wraparound is traditionally seen on period properties that have alleyway space to the back of their property. This dead space, common on Victorian buildings, allows you to extend to both the side and to the back, creating an L shape that wraps around existing space. Unlike classic rear extensions, you don’t have to sacrifice as much green space to get bags of more room. Ideal if you live in densely packed areas, such as London. It uses up the dead space in your home’s side alleyway, space that’s often wasted, used either as a corridor or under stairs. Why not get it working harder? Of course, this kind of extension is only open to households who have the required side space. On average, you can expect to pay £65k + VAT in London and £40k + VAT upwards in other areas of the UK. Permitted development rights or planning permission? Unlike side and rear extensions, wraparound extensions always require planning permission. Whereas other extension types benefit from a government scheme that allows small extensions to forgo planning, and guarantees approval, as long as certain requirements are met, wraparounds aren’t so lucky. All designs must go to your local authority for approval, and can face rejection. The best way to protect yourself from refusal is to hire an architect to both design and submit your project for planning. A good architect will have extensive experience of planning policy, meaning they can steer you away from the common mistakes that derail applications. What’s more, with an architect working as your planning agent, they’ll be able to make any quick changes to your design, should the council suggest these are needed to get approval first time round. Planning applications can take 8 weeks for a decision to be made, so factor this into your timeline. However, once you’ve got planning approval it lasts up to 3 years, and can even be sold with your home, giving boost to your house price without even the need for construction. When this developer came to Resi, they were keen to expand this Victorian period property, in order to get maximum returns from the future sale. However, we did such a good job, that the client actually decided to live there himself! Showing no one can resist good design. Starting out, the client wanted to expand the rear of his property, and create a large kitchen/dining area that could be used by the family, along with a sociable environment for friends to visit and be entertained. In order to achieve this, we decided to create a wraparound extension, one that expands the space from both the rear and the side. Because we wanted this new space to feel as open as possible, we worked alongside a structural engineer to help us design a room that wouldn’t be broken up by any columns. To achieve this, we used recessed steelwork to give clean lines, with a hidden crank beam nestled into the structural party wall. To avoid any conflict with neighbours, we advised our client on party wall matters, sparing them any legal headaches. As a beautiful period property, our client was keen to retain some of the natural charm of the building, while also having those flashes of a modern touch. For that added WOW factor, we went with creating a glazed roof. 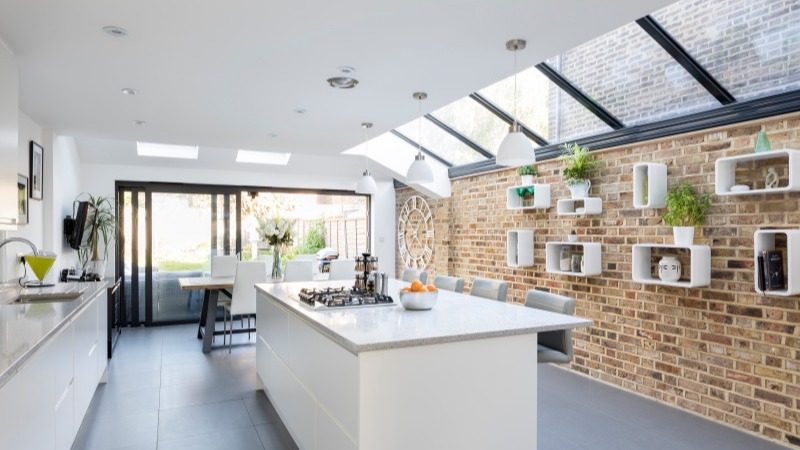 Though more expensive than traditional skylights, it really helped to open up the space and bring that all important light in throughout. And for that classic touch? We created an exposed brick wall, made from London stock bricks. A homage to the home’s history in the capital. Lastly, to tie everything together with the home’s fantastic outdoor space, we added large sliding glass doors. Allowing any occupant to move seamlessly from kitchen to garden, especially in those summer months. And with so many wonderful features, is it any wonder this developer couldn’t bear to part with this home? What are the rules on house extensions?